Shah Rukh Khan’s children Aryan Khan and Suhana Khan are most probably the upcoming superstars of the Bollywood. Like daddy, both have that class and style which are necessary to leave a long lasting impact. And if we talk about acting, guys their father is an institution in himself. Recently, at the opening of Mumbai-based restaurant Arth designed by Gauri Khan, Shah Rukh and Suhana were seen playing the role of perfect hosts to all the guests at the party. According to the inUth, Suhana Khan wore a stunning bright orange bandage dress and looked like a princess. And if we talk about the price of that dress, it costs approx Rs. 60,000. Yes, that’s true. It is a normal thing for her as she is a princess of king khan. And what a prince wears? Yes, we are talking about Aryan Khan, Shah Rukh’s elder son and brother of Suhana Khan. Wearing a casual denim jacket recently, Aryan was out with his friends. 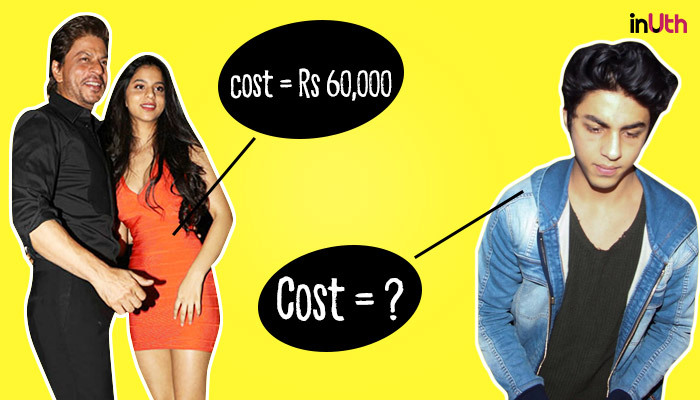 And if we talk about the cost of his jacket, guys, it costs way too much as compared to Suhana’s dress. He wore a Balmain hooded denim jacket and it costs approx Rs. 88,755. Aryan And Suhana’s Debut in Bollywood? In a press meet, Shah Rukh Khan spoke about his children’s acting debut in Bollywood. He said both the children have the freedom to choose their careers. According to Shahrukh, Suhana and Aryan have to complete their degrees first and there is still a long way for them to enter Bollywood.